As you can see by this article in Trade Only Today, wake (or “ski”) boat sales remained steady in May of 2015 compared to May, 2014. This is promising news because of a 1.6% drop in overall recreational boat sales (including “ski”) during the same time. Recreational boat sales fell in May, declining in both the main powerboat segments and industrywide for the first time in 15 months. The drop was small — 1.6 percent, or 241 boats, to 15,003, in the main segments, and 2.1 percent industrywide, or 501, to 23,363, in 27 states, or about 65 percent of the U.S. market, in Statistical Surveys’ monthly report — but it marked the first time since February 2014 that sales were broadly lower. The industry has been achieving steady, moderate gains for the last three years as it recovers from the sales slump that occurred during the Great Recession. Minnesota had the largest decline among the early-reporting states. Sales fell there by 515 boats, from 2,658 in May 2014 to 2,143 this year, but the state still placed fourth in the rankings. Sales fell by 110 in Texas, from 2,526 last year to 2,416 this year, but the state still ranked third nationally. Florida led the nation and showed a gain, as it usually does, reporting 3,356 sales, 506 more than the 2,850 it had last year. Statistical Surveys national marine sales manager Ryan Kloppe said manufacturers and dealers did not tell him that they were seeing a slowdown in sales. Kloppe said he expects sales to rebound as the summer selling season moves forward. The only high-volume category in the main segments that showed a sales increase for the month was 11- to 40-foot fiberglass outboards, a stalwart segment during the industry’s long recovery. Sales rose 4.9 percent to 4,114 boats. 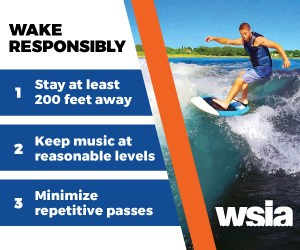 Even sales of personal watercraft were lower, dropping 2.9 percent to 5,695. 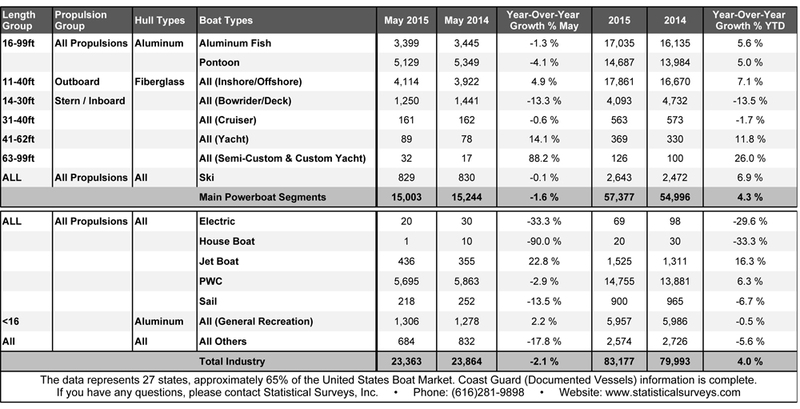 Two consistently strong categories — aluminum fishing boats and pontoon boats — showed declines. Fishing boat sales dropped by 1.3 percent to 3,399 and pontoon sales fell 4.1 percent to 5,129. The bigger-boat categories generally fared better. Sales of 31- to 40-foot cruisers were nearly flat at 161 boats, but sales of 41- to 62-foot yachts rose by 11 to 89 and sales of 63- to 99-foot custom and semicustom yachts rose by 15 to 32. Apart from Florida, Texas and Minnesota, the top 10 states for sales were: Michigan (No. 2, where sales rose by 155 to 2,833); New York (No. 5, where sales fell by 107 to 1,773); North Carolina (No. 6, where sales rose by 53 to 1,373); New Jersey (No. 7, where sales rose by 113 to 877); Ohio (No. 8, where sales fell by 93 to 796); Tennessee (No. 9, where sales fell by 126 to 769); and Washington (No. 10, where sales rose by 77 to 690). Sales of jetboats rose nationally by 81 to 436; ski-boat sales fell by one to 829. Sailboat sales fell by 34, or 13.5 percent, to 218.